The great thing is, of course, you can just switch. Hit up your browser preferences, and swap your default to Bing. I know, I know, but yes I'm serious. Sure, Bing had a rocky start. But if you haven't seen it recently it's worth another look. It has a super clean interface. It's fast. And operators work the way you expect them to. Best of all it's relevant. I've been using Bing as default search engine for at least half a year now. Never felt the need to go back. As to overall performance, we saw a good deal of stutter in the Galaxy Nexus before us. Taps were not always recognized and there were occasional delays in performing an instruction, though in Google’s defense, it was a phone fully loaded with running tasks and the software is being continually improved and optimized (i.e. it’s not yet fully baked). That having been said, it unfortunately remains the case that Android isn’t as swift and responsive as iOS or Windows Phone (or even MeeGo Harmattan on the N9). Or at least it wasn’t on the demo phone we got a look at. The subtle, pervasive lag that has characterized the Android UI since it inception is still there, which is not a heartening thing to hear when you’re talking about a super-powered dual-core device like the Galaxy Nexus. Maybe instead of cramming the device with rarely used gimmicks you should fix the basics first, no? De nieuwe HTC EVO 4G is uit in Amerika. Een heel mooi toestel met super specificaties. Gratis uitgedeeld aan een select groepje mensen op Google I/O. Direct gaan mensen vergelijken met de Apple iPhone. Ook met de iPhone die nog niet eens op de markt is. Puur op specificaties die niet bevestigd zijn. Leuk en aardig, maar is het relevant? De zoveelste iPhone killer. Maar mensen zijn appels en peren aan het vergelijken, en daar zit hem de crux. Ten eerste is Android geen telefoon maar een OS. Niets meer, niets minder. Je zou een vergelijk moeten maken met iPhone OS, niet zozeer tussen Android en iPhone. Maar goed, als we ons focussen op de Android EVO 4G HTC in vergelijk met de iPhone 3GS heb je inderdaad wel een redelijk vergelijk. Uiteraard vergelijk je (bijna) 2 jaar oude techniek met techniek die een week oud is, maar ok.
Alleen, neem eens een stapje terug van de techniek en kijk naar het proces als geheel. Apple heeft in principe 1 handset: de iPhone. Zelf ontworpen, zelf gemaakt (niet letterlijk natuurlijk, Apple laat ook liever mensen in China bouwen om de kosten te drukken). Google heeft de Nexus One. Niet zelf gemaakt, puur een HTC zonder badge. Google heeft wel Android. Ook niet echt meer zelf gemaakt, maar Open Source en gebruikt door een consortium van fabrikanten. HTC, Motorola, Sony Ericsson, en meer. ChromeOS seems to be redefining computing for many users. The concept of a "cloud-only" environment is new and really takes some effort to understand. With ChromeOS, the user won't need to worry about files and folders anymore. Users only need to worry about content. Photos, Movies, Documents, etc. Hopefully with a sensible name. I'm not sure how Google wants to go forward in managing this without the legacy concept of folders and files, but we'll see. @luclodder indeed commented that Google is already doing this in gmail using tags and search. Back in 1998, 1999 there was a small company called Be Inc. Their success on the desktop was not what they expected and Jean Louis Gassée, the CEO of Be came up with the "brilliant" idea to start making so-called internet devices. Lightweight devices running BeOS. The iPad, archived on Scot Hacker's site here: http://www.birdhouse.org/beos/byte/07-IPAD/ was one example. Be wanted to be inside every device. From your fridge (ordering milk if needed) to TV (web experience). The idea never took off, and eventually Be Inc was bought by Palm and we never saw anything from BeOS or iPad again. It does seem though that the time is now right for these devices. ChromeOS seems to be made for lightweight devices. Most people now think that ChromeOS will be for lite netbooks, a laptop like computer that you carry around. But Google could take this much further. ChromeOS can essentially run in any device. Imagine having a small touch-enabled screen in the kitchen. Connected to the internet, you are just a few clicks away from ordering groceries. Or check your email while waiting for the oven, or load that latest recipe from that cooking forum. ChromeOS can run in your TV set. Streaming the latest movies. Playing the latest games. Chatting with friends and relatives. Or even in your car. Guiding you towards that new restaurant you want to try. Streaming your favorite radio channel. Just regarding ChromeOS as a means for an even lighter netbook is shortsighted. It looks as if Google is reaching beyond this, it wants to be everywhere. 1984 and 1999 all over again? 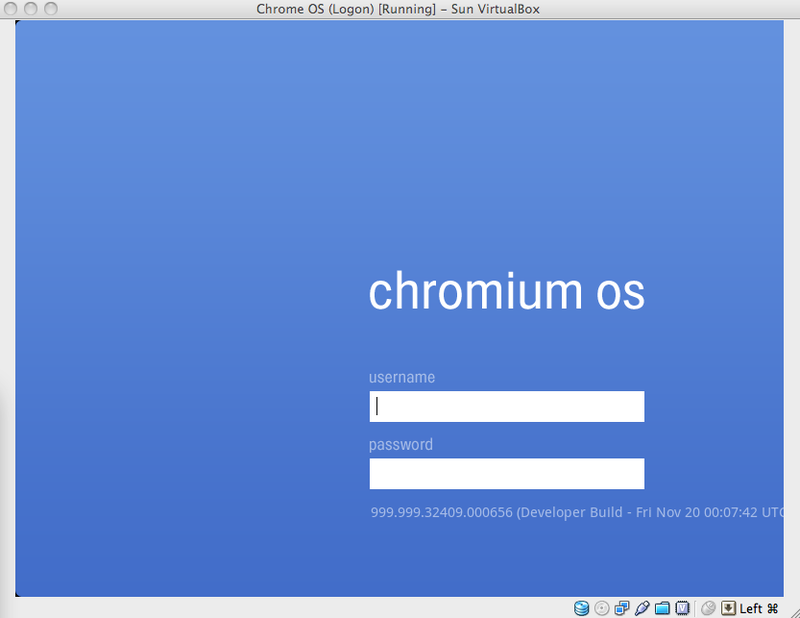 I downloaded a VM image of ChromeOS and booted it in Virtualbox. There's not a lot there. ChromeOS essentially is Chrome running fullscreen on top of a linux distro. As you can see, they haven't done much in the preference department yet. Everything points towards the local drive, no sign of real "cloud" power. It boots ok, just in 10 seconds. It browses ok. Works fine, youtube also plays ok-ish. However, try to save a file and it will. Try to open the downloaded file, and it won't do anything. I even got it to hang on this. Nice browsing OS for now, not much better than the Wii web experience though. Low resolution, low functionality. The Palm Pre was announced in early 2009. The apps will be created with web techniques, using cloud services to store and sync your stuff. Let's go back to the introduction of the Original iPhone. Steve jobs stated that apps should be created using web techniques and use cloud services to store and sync stuff. All hell broke loose! That was insane! You can't create a decent application with only online storage and tools! So, what has changed by then? The web techniques were available then already. So why don't we hear anyone complain about Palm? And why is this GMail webapp so important all of a sudden? As an answer to the article linked above, I don't think webapps will be a thread to the appstore. They're an addition to. Some apps you still want to run locally. Someone smarter than me please enlighten me about the conflict above though! ?